Writing a blog post for your business is easy. Building a blog post that makes a meaningful impact on your business is extremely, extremely hard. You need a cohesive plan detailing all parts of the process, from persona development to keyword data to the writing itself. At Nectafy, we plan and write blog posts for our clients. Each post is designed to make a meaningful impact on visits, leads, and revenue. These are not your “Weekly Roundup” and “Check Out Pictures From Our Christmas Party!” posts. If you are writing those, they probably are easy—I’ll give you that—but they also aren’t doing anything for your business. Today, my goal is to share a story about one blog post we did for a client that has kicked off big results, and to peel back how we planned, wrote, and optimized it over the past three years. STEP 1: Strategically plan the post. 1. Persona: Is this topic something one of our personas would be interested in? That’s always the first criteria to check, and the deal breaker. √ One of ClearPoint’s main personas is “Reporting Rachel”—an analyst or manager in charge of tracking company reporting. She’d be interested in reading about KPIs. 2. Keyword competition: If you are a paying Adwords customer, Google provides a competition index for keywords. It’s a number between 0 and 1 (1 = most competitive, 0 equals least). The number is based on how many advertisers are bidding on that keyword. It’s a good indicator of how challenging it will be to rank organically. √ The target keyword, “key performance indicator examples” had a competition level of 0.03 in 2015 (not competitive at all). 3. Monthly search volume: Google will also provide monthly search volume (if you spend a certain amount in AdWords per month). How many people search the keyword (or close relatives to the keyword) per month? √ The main keyword was searched 400 times per month—with the total group of keywords we were targeting coming in just over 1,000. Bringing in a few hundred new organic visitors per month at that point was certainly a number of searches we were willing to target. This idea met all our criteria, so we planned the post. Write about keywords that are less competitive on a scale of 0 to 100 than your site’s domain authority on the same scale. If you have 1,000 organic visits per month, be willing to write about keywords with 50 searches per month. If you have 10,000 organic visits per month, write about keywords with a few hundred searches per month. 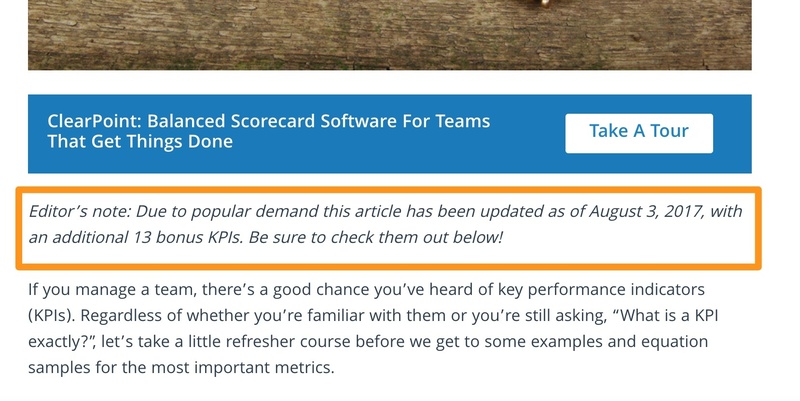 Write about KPIs for your persona (seriously, we’ve gotten it to rank for every site we work on). Write about topics you have expertise on or you’ll turn out average content that won’t rank. STEP 2: Rewrite the post when it inevitably dies. A successful blog post will typically have about a 2-year lifespan before Google considers the content old and stops sending people your way. I've broken that into four phases to tell the story. You can see we rewrote the post after about two years because we had been experiencing steady declines in views. The way you continually grow blog results multiple years after publishing is by 1) rewriting old posts to preserve their value, AND 2) getting results from your new posts. If you don’t rewrite the old ones, your new ones will likely grow at the same rate your old ones decline. For each new post that gets a ranking, you slip on one that had a strong ranking a few months ago. If you’ve been blogging for a few years and your numbers have been flat lately, that’s what is happening. Side note: If you want this spreadsheet, tweet at me and I'll send it to you. There isn't a great way in Google Analytics or HubSpot to track all of your posts over big chunks of time. You can look at each post individually (too time consuming), or total posts together (doesn't tell the story). Analyze your old blogs’ views by month over the lifespan and check for major declines. 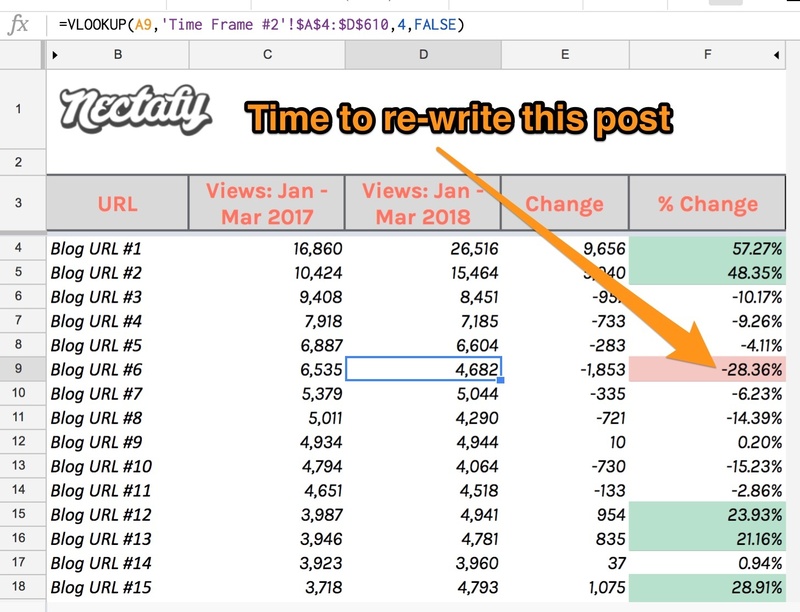 Rewrite and republish old posts that have slipped in visits and keyword rankings right around the 18- to 24-month mark. If the old content is still relevant, add to the post with additional, useful information and republish. Track time on site for your blog posts. There is a huge correlation between time on site and views/rankings for that post. STEP 3: Run conversion tests on the post. The default blog strategy is to post a certain number of articles per month, and just keep the train on chugging. Rewrite old posts (mentioned in step two). Combine posts that are competing on the same keywords, and neither is on page one. Add new, fresh content to posts that are close to ranking but need a boost. Treat posts like the lead generators they are, and plan ongoing conversion tests. On our one million-view blog post, we’ve tested the calls to action (CTAs) multiple times, and found major success with the new CTAs we added. This was the only action we asked people to take, and it happened at the bottom of the post. In addition, that type of CTA just isn’t as effective as it was a few years ago. People generally look away from designed graphics these days because they know they’re being sold something. We knew we had a lot of authority and visitors around “KPI” keyword phrases. So we took some specific action to try to get more out of thousands of views per month. 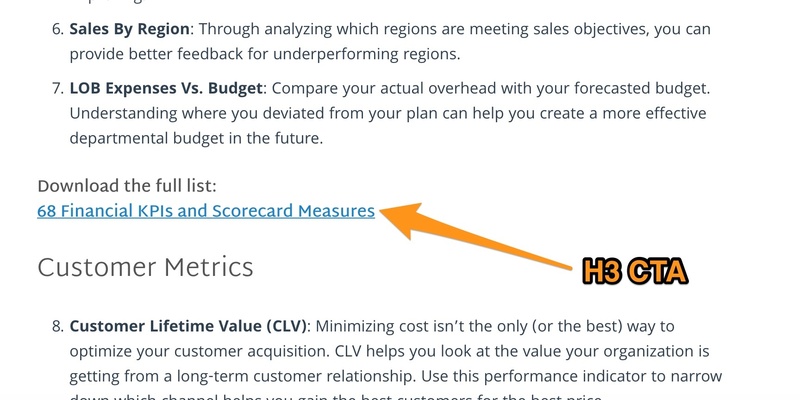 We created a series of KPI libraries: a list of metrics you could download if you were in charge of HR, customer success, finance, or local government (another ClearPoint persona). We added H3 CTAs (I encourage you to read this) throughout the article, perfectly matching the section. Here are the results of this conversion test. *We attribute a lead to this article if it is the first page they ever see on the site. In HubSpot, that’s an all-important “First Page Seen” metric we use often to source leads to specific pieces of content. After we made these changes, this blog post brought in 71% more leads than before. Now, this post was capturing more than 700 leads per month. Track the conversion rates of your blog posts. If you get 100 people to read a blog, how many become leads? Run conversion tests on the most-viewed posts to increase the number of leads from your blog, without having to increase views at all. 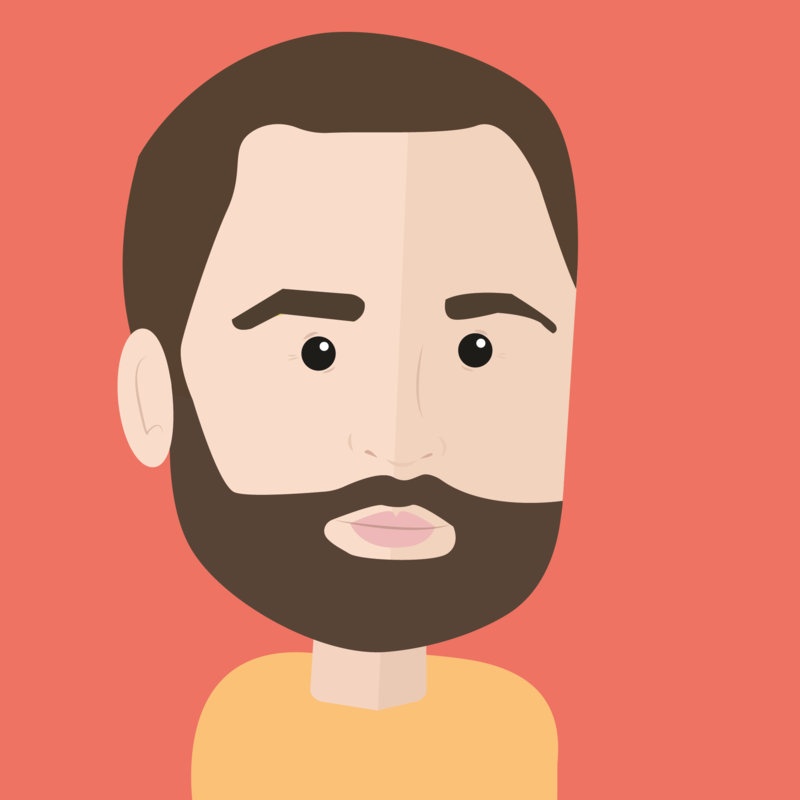 Try H3 CTAs—they’ll seriously impact your blog conversion rates. Received over 1 million views. Ranks on page one of Google for “KPI” and “key performance indicators” and 50+ related keywords. Brought in over 600 leads per month. Generated a return on investment (ROI) of 80x. This blog post was written once, rewritten again, and tested for conversion, costing about $800 total. Brought in $65,000 in new revenue. You can find your company’s diamond-in-the-rough, high-performing blog post by following these steps. 1. Stop with the "Our July 4th Party Was Fun” and “Company Update #18” blogs—no one cares and they don’t positively impact your business. Actually, talk to us about this situation. We could help get meaningful business results from your blog. 2. Stop thinking you’ll be able to rank for competitive keywords if you can’t. Download the MozBar and check your website’s Domain Authority (DA), a number from 0 to 100. Write about keywords that have less competition on a scale of 0 to 100 than your domain authority. Check the first-page results of the keyword you want to target. If you see Wikipedia, Forbes, Wall Street Journal, Huffington Post, and others on there , move on. You don’t have a shot. 3. Stop caring most about monthly search volume of keywords. The main keyword we targeted with this post had 400 searches per month. If all went right, we’d expect about 300 views per month to the post. 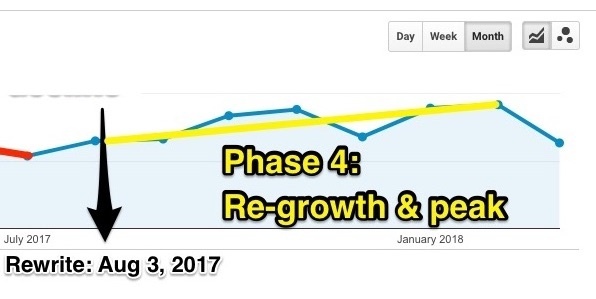 We ended up cranking out 40,000 organic views each and every month. If you target keywords your site has no shot at, you’ll end up with 0 views out of a potential 100,000 searches. If you write about much less competitive topics, you’ll have a chance at 1,000 views out of a potential 2,000 searches. Make search volume your third most important criteria, behind relevance to your persona and competition. 4. Start seeing your blog posts as living pieces of content, not articles you write and forget forever. Even the most successful blog posts will start to die around two years. Stay on top of those declines and rewrite the post to regain its rankings. Run CTA conversion tests on the post, and track results. If you have better calls to action throughout a post, you can seriously increase lead generation without increasing views at all. If you have thousands of views per month to a specific post, consider creating a whitepaper or another download directly matching the blog content. 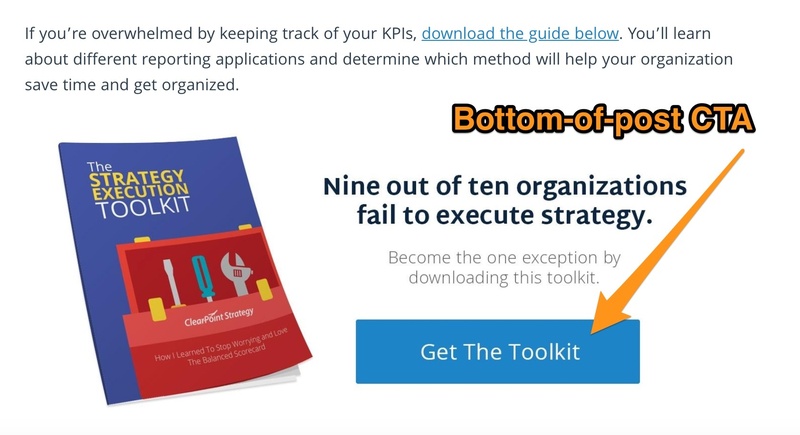 Download/CTA: HR KPI library, customer success KPI library, etc. 5. 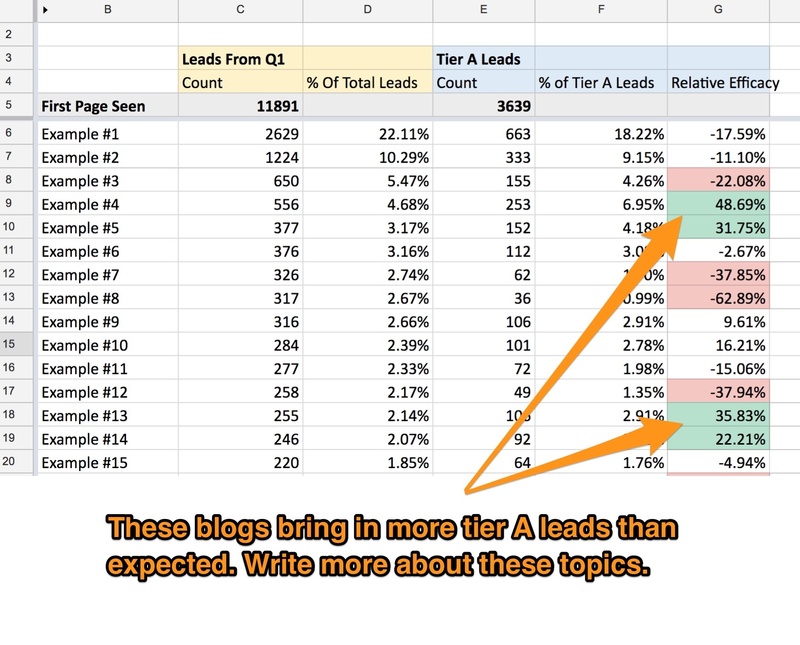 Start tracking which blog posts and topics bring in the right leads. For blog post X, 100 leads turn into 20 MQLs (twice as effective than the average). Takeaway: Write more about this topic. For blog post Y, 100 leads turn into 5 MQLs (half as effective as you’d expect). Takeaway: Write less about this topic. Follow the specific steps outlined here for your own posts, and I guarantee you’ll see better results with your blog.